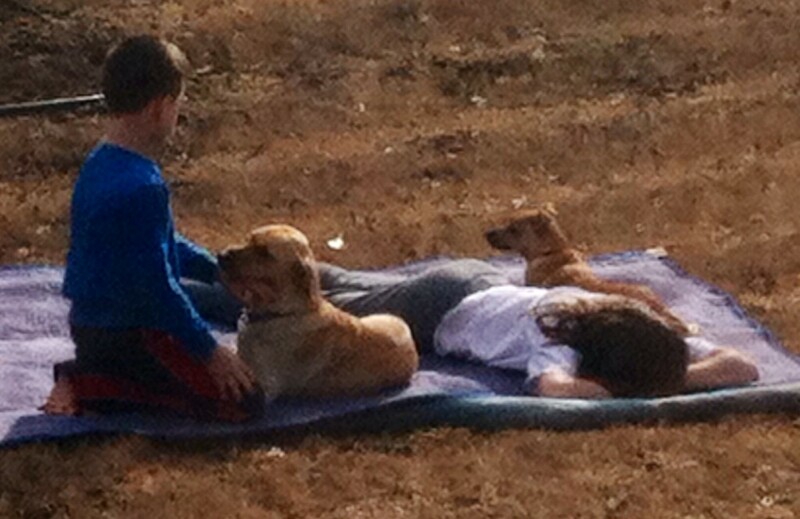 I took this picture today of my kids with our two dogs, Sandy and Scooter. Sandy is the bigger dog and if you look closely, you will see Scooter, our smaller dog. They bring so much joy to our lives! We have had Sandy since she was 6 weeks old and have noticed something different about her as she has gotten older. She is a very unselfish dog. When we feed our dogs, we fill up two bowls of food. Every day, Sandy stands back and lets Scooter eat first. Scooter runs from one bowl to the other and eats his fill. Only after he is finished will Sandy go to eat. It is the same way when we give them treats. Scooter is like a mad-man on a mission. He is jumping up going crazy, waiting to devour the treat, while Sandy stands back….waiting for Scooter to finish his treat. Strange isn’t it? It is not typical dog behavior. I wonder what makes Sandy that way. We certainly did not train her to be this way. Now it may seem a little silly to compare a dog’s actions to God’s Holy Word, but God reminded me of His Truth through Sandy. Sandy’s unselfish demeanor is rare for a dog. I think it is also rare for a human….even for a follower of Christ. I am a person who is usually on a mission. I dart into the grocery store to grab the necessary items and race out so I can get on to the next thing. I am usually in a hurry. I want to find the shortest line at the grocery store, and the best parking space. I do not like to wait. I have a timeline and I do not want to be slowed down. What about you? If we are honest, I think most of us like to be first! We typically do not like to wait. We greatly value our comfort and our time. We strive to be unselfish people, but it does not come naturally. We strive to put others first, but if we are honest, it is difficult for us to be this way. There is a battle that rages inside of us….a battle between our flesh and our spirit. Our flesh says “me, me, me” while our Spirit seeks after the things of God. Each day, you and I are faced with choices to make. Will we be selfless or will we be selfish? Will we seek to satisfy our fleshly desires or will we seek after God? Will we put the needs of our spouse above our own? Will we take time to talk with a friend in need? Will we go the extra mile for a stranger? Following after Jesus requires me to die to myself each day. Each day is a new opportunity for me to grow closer to Him and for me to allow Him to be Lord of my life. Following after Christ requires humility and selflessness. In my own human power, this is not possible, but with Jesus, it is! It is only because of Jesus that I have any possible chance of being a selfless, humble person. Because of His grace and His love HE can accomplish these things in my life and in yours. Let us not be fooled into thinking we are “good” enough. We are not! It is God who fills us up with His Spirit and He transforms us. Our job is to yield to Him by loving and obeying Him. We must die to our own selfish desires and allow Christ to reign. Remember my friend, God is always at work around us. He is speaking to you and me and He is drawing us in to Himself. We need to be watching for Him. We need to pay close attention. As He speaks to you and me, we need to have hearts ready to listen. God will meet you and me right where we are and He often speaks through the most unlikely of things……like a sweet, unselfish dog. May we die to ourselves and allow Jesus to be Lord of our lives! May we live in such a way that others wonder what makes us that way. May we be quick to say it is only because of Jesus! Download Britt Nicole Photos from Time to Shine! Enjoyed this so much! God Bless!